You can protect and assign permissions to a folder on your PC and any subfolders or files it contains or that are saved to it will automatically be protected with the permissions that you have predefined. (Only available to Premium or Corporate). 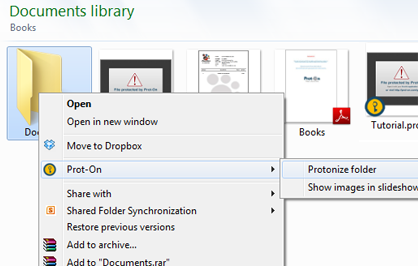 On the desktop of your PC by clicking with the right button of the mouse on the folder, go to Prot-On icon and “Protonize folder”. 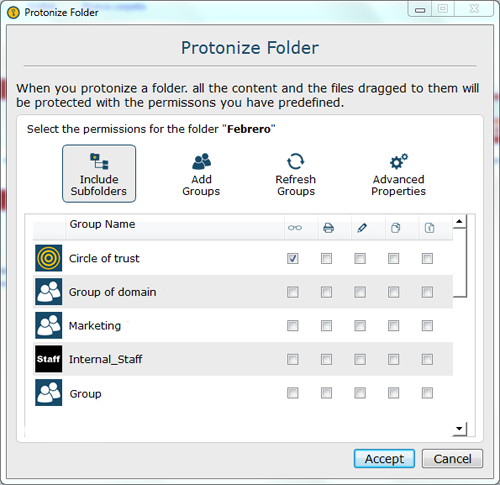 When you chose to Protonize Folder you will be shown a window where you can define the folder permissions. Once the permissions are defined all the documents contained in the folder (MS-Office documents, PDFs, photos, video and audio files) will be protected. You can add any documents to this folder and they will automatically be protected and assigned the permissions associated with the folder. You can change the permissions, advanced properties or remove protonized whenever you want, right click of the mouse select Prot-On on the protect folder and select “Manage Permission”.